Overhead door systems are designed to last a long time. They’re tough and durable, and each individual component is usually built to last. However, with a machine as complex as this, small problems can develop over time – the good news is many of these can be handled by homeowners themselves. Read on to learn how a little bit of DIY maintenance can go a long way when it comes to extending the working life of your door. There are many moving parts in a garage door, all of which require a little lubrication from time to time in order to move smoothly. If they run dry they’ll start to wear out much faster, and may start to make a lot more noise when in operation. Apply white lithium grease or a silicone-based spray (not WD-40) to the roller tracks and springs, as well as metal hinges, locks and bearings. This will help reduce wear and will also protect against corrosion. 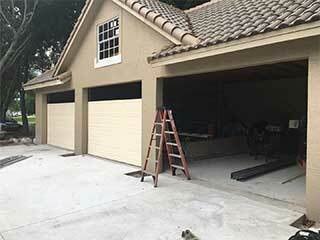 One of the best things you can do for your garage door is simply to take a good look at it and pay attention to any changes. A careful inspection every now and then is a good way to detect problems before they become more complicated to solve. Examine your tracks for dents and check that the safety sensors are properly aligned. Look for signs of fraying pulleys or corroded rollers, and make a note of any potential trouble spots - if you take care of them now, you’ll avoid expensive repairs further down the line. A smart, clean garage door can make your home look wonderful, but the paint can fade over time. White doors, especially, tend to show marks and scuffs more than others. Sooner or later you’ll want to repaint the door and restore its clean finish. If you're doing this yourself, clean the door down then sand it back, so the new coat of paint sticks properly. Prime first (with a large brush, not a roller), allow drying, and then applying one or two coats of your desired paint. A good and even paint job doesn’t just look great - it will also help to prevent corrosion, making this process well worth the time.